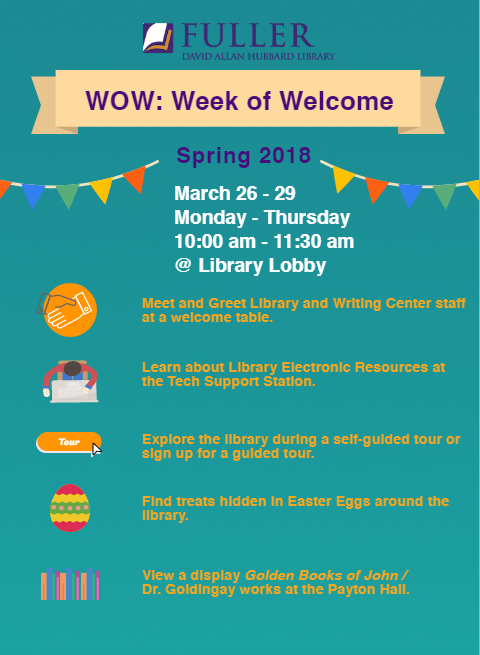 WOW: Week of Welcome Spring 2018 at the Fuller Library! Fuller Library > News > Event > WOW: Week of Welcome Spring 2018 at the Fuller Library! Come over and invite your friends to have a wonderful start of the new quarter! Can’t visit the campus library? Click the “Ask a librarian” tab on the Fuller library home page for a live chat. Would you like to get in touch with reference librarians? Email us at lib-referenceafuller.edu. Librarians, Library Tech Help or the Writing Center through a library reservation portal here!